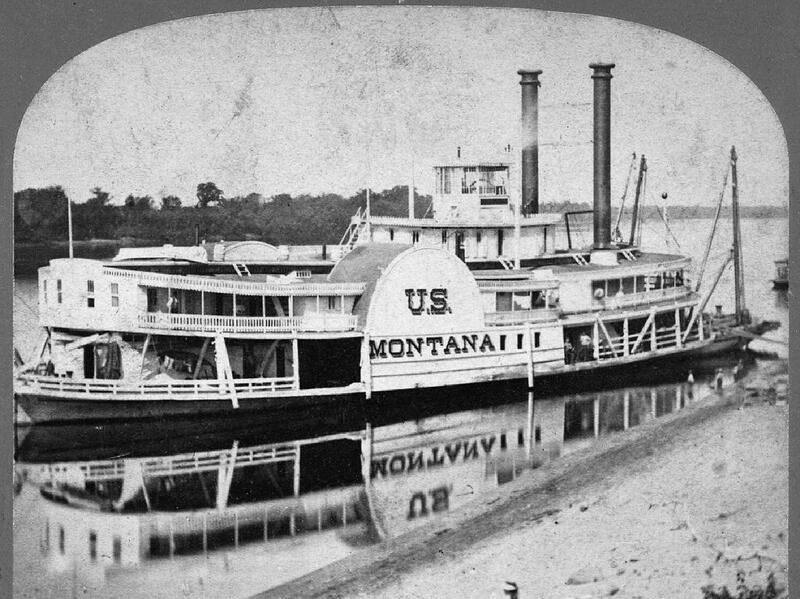 Missouri River steamer Montana in 1864 from a stereo view. A low angle view of the ROB'T E. LEE also from a stereoview and also taken at the New Orleans levee. 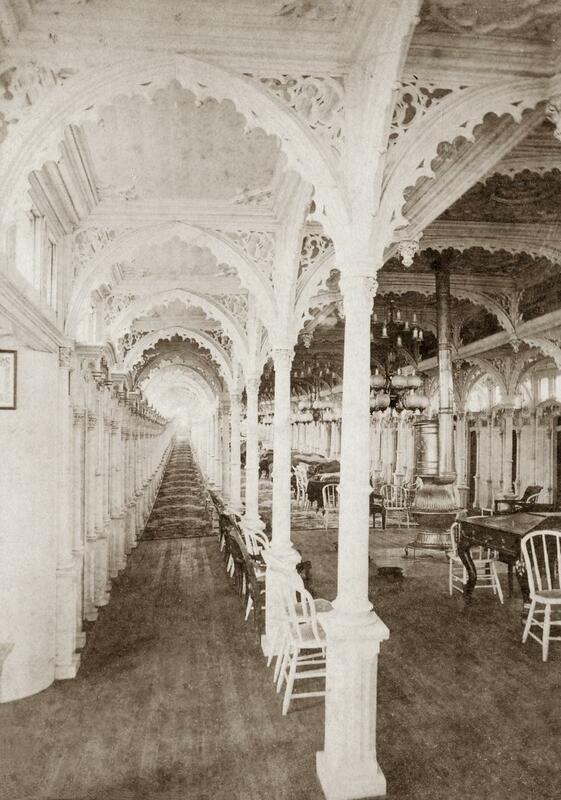 This is a rare photograph, pretty much a mirror image of the angle that Cornwell painted the LEE from for his painting of the race with the NATCHEZ. I own the original of this stereoview in my collection which I loaned to Ralph DuPae and he had it copied for the La Crosse Steamboat Collection University of Wisconsin. 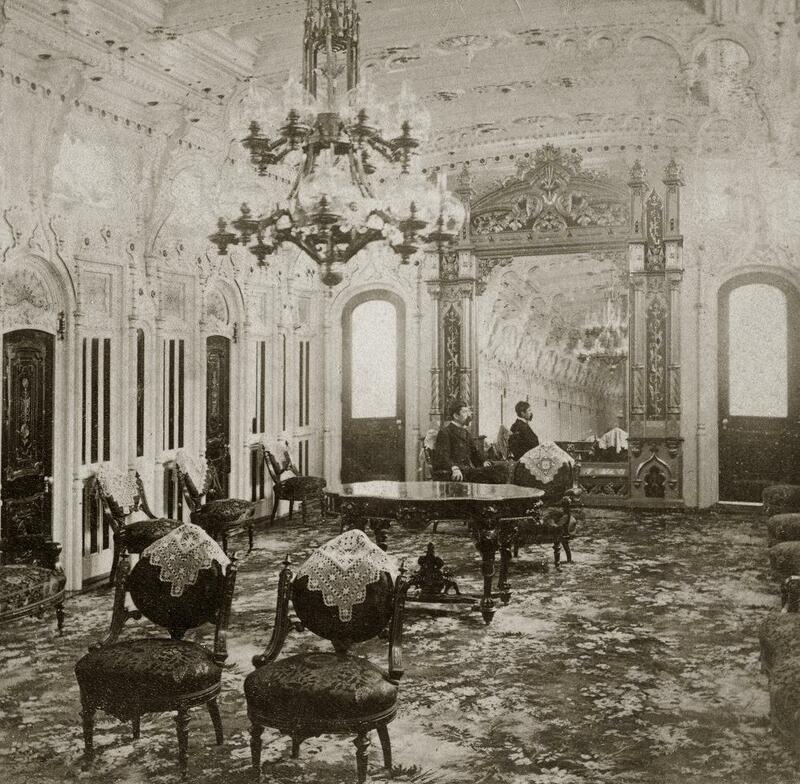 Such deluxe Victorian splendor and opulence! 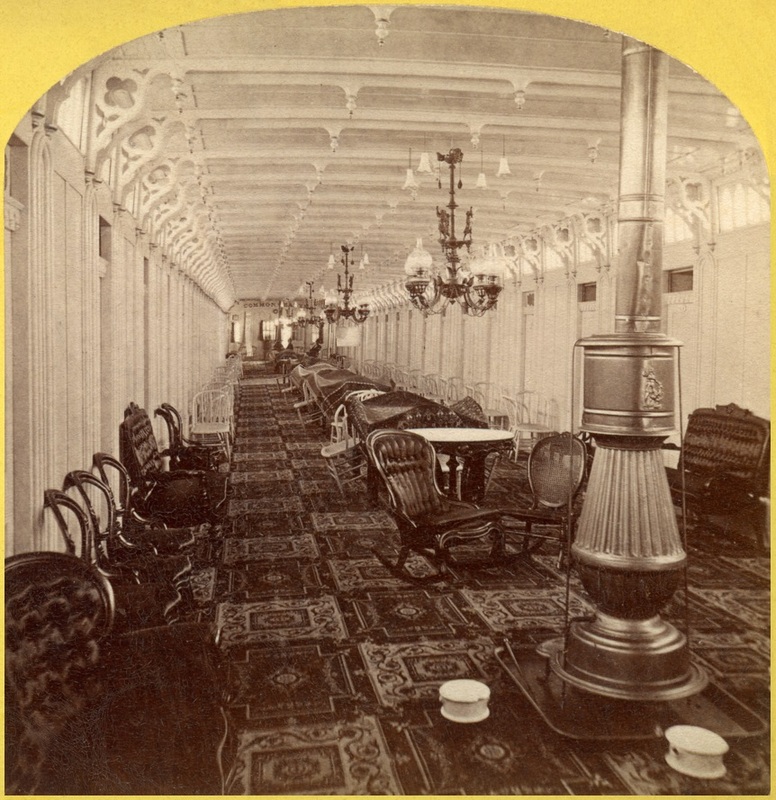 Stereoview "Drawing Room, Steamer City of Natchez, Mississippi River." From my stereoview collection . 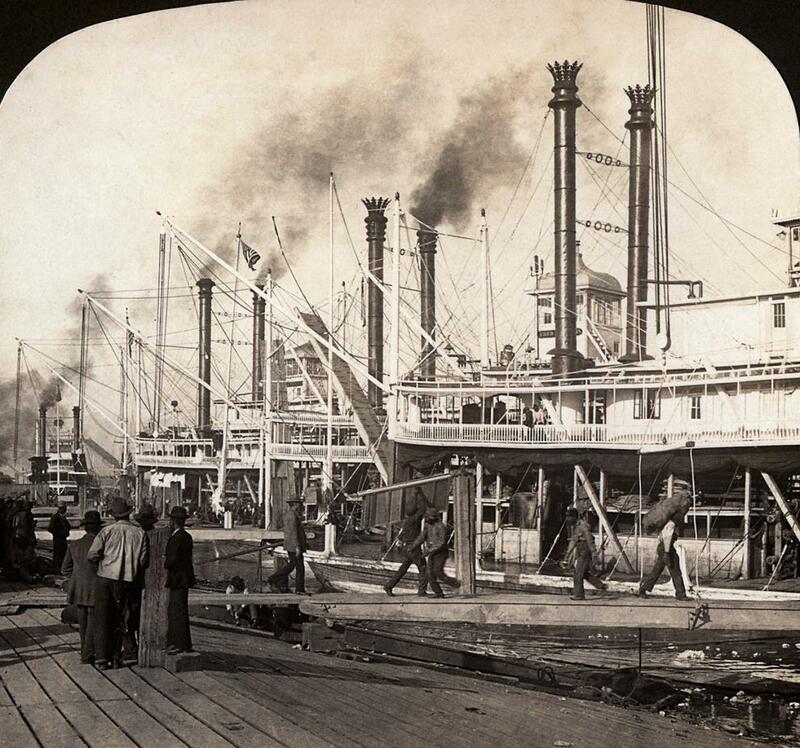 . .
From a stereoview of the Red Wing 1870. Those huge smokestacks and outsized flags are amazing, must've taken 3 men and a boy to raise banners like that. Low bridges already must have made stacks this high impractical. Stereoview by Underwood amp; Underwood "S 174" No. 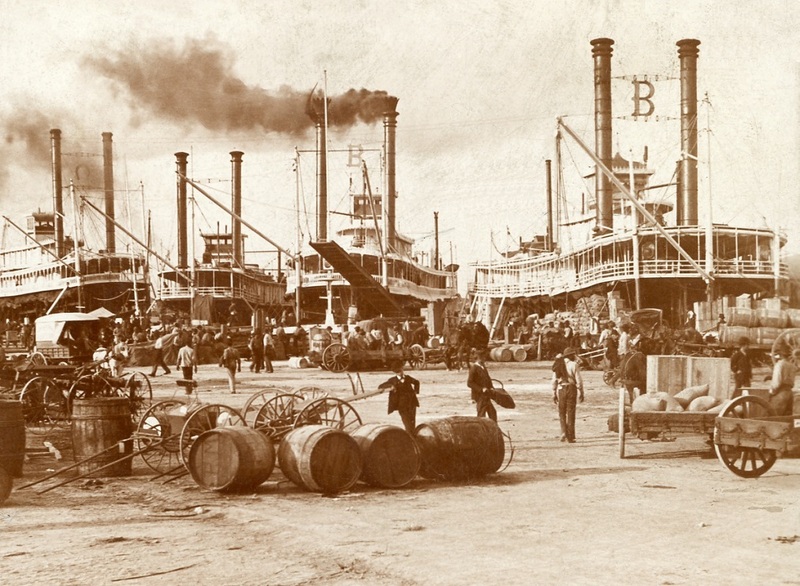 11212 "Busy ship-crowded wharves on the Mississippi, New Orleans, U.S.A."
I always think of these vessels as "boats," not "ships" but suppose it depends on your "preference." Scanned from my vintage stereo view of the back end of the cabin of the MINNEAPOLIS. 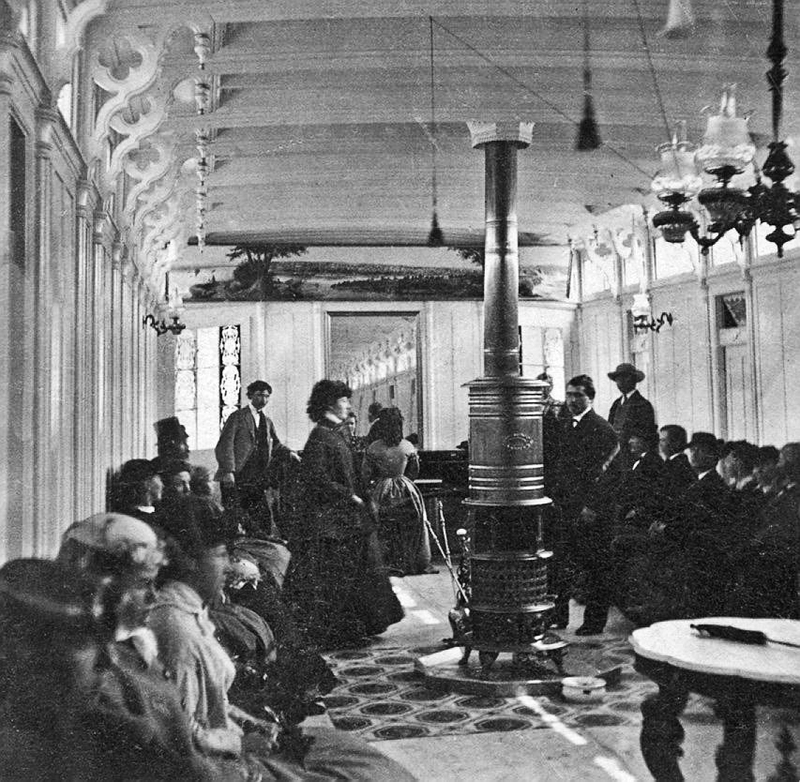 A lady is playing the piano for the passengers. She is facing a mirror that reflects the cabin. Steamboat authority and collector Bert Fenn of Tell City, Indiana loved this photo and I gave him a print of it. On October 23, 1880, the La Crosse (Wisconsin) Morning Chronicle published that the MINNEAPOLIS sank in 6 feet of water, one mile above Denmark Chute, a short distance above Louisiana, Missouri. She was raised. The RR has done it." 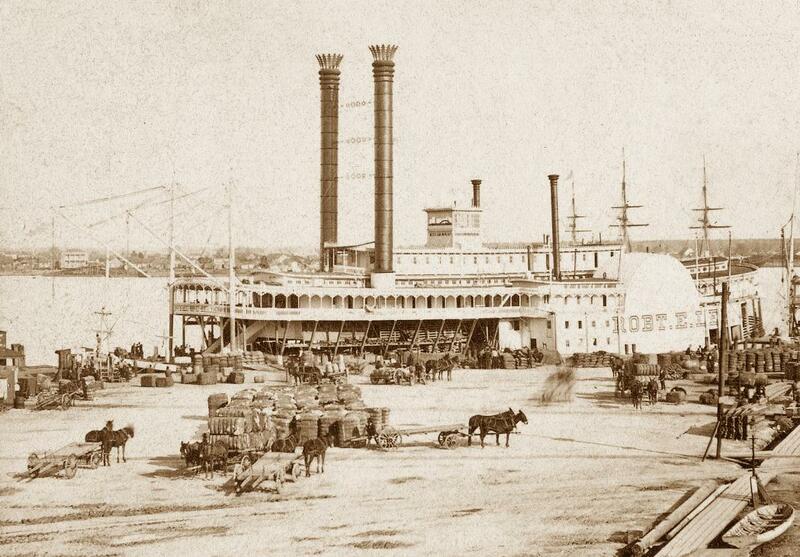 From a stereoview of the Pilot House and Texas aboard the Commonwealth steamboat. A stereoview offered two photos that looked like a three dimensional image. 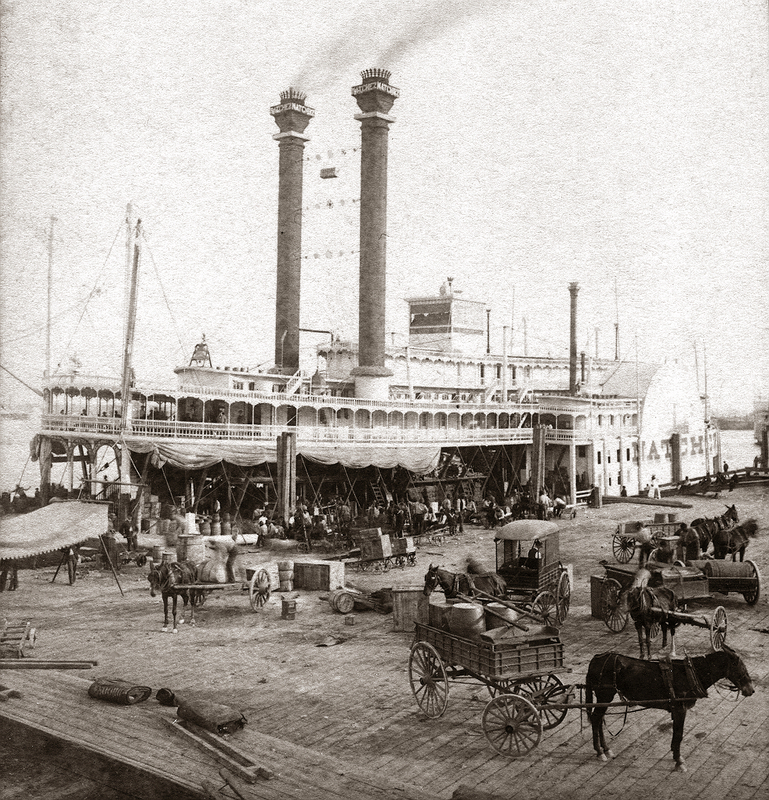 Ran New Orleans-St. Louis 1866, with James Lloyd, master, and James K. Boyles, clerk. In 1868 Benjamin F. Hutchinson of St. Louis had a three-quarters interest in her, and M. W. Beltzhoover of Allegheny City, Pennsylvania had a one quarter interest; Captain William Conley was master. 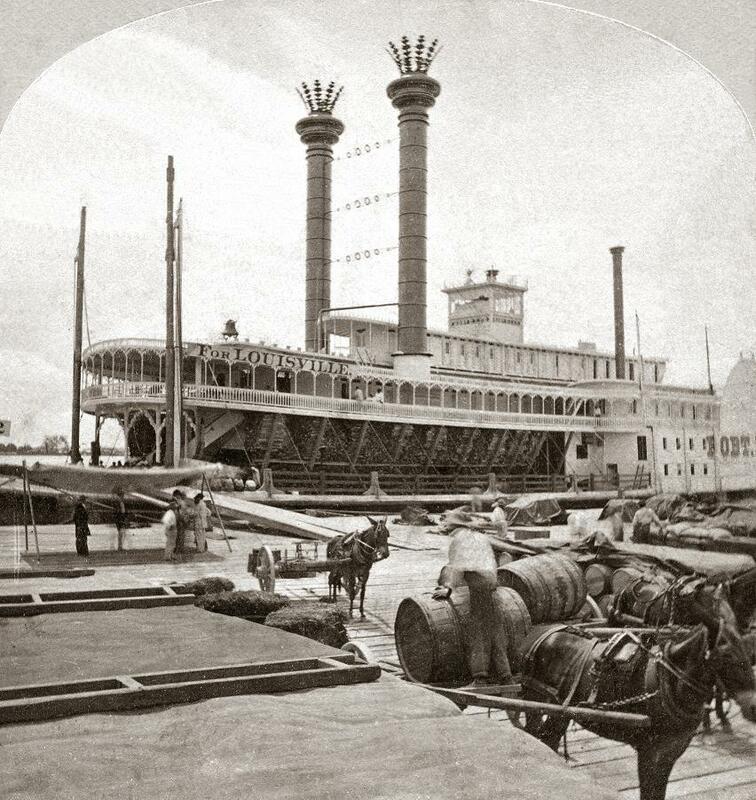 In May 1873 she was sold to Captain J. P. Sedam and others who extensively rebuilt her, then could not pay the bills. A U.S. marshal libeled her at St. Louis in November, 1873. 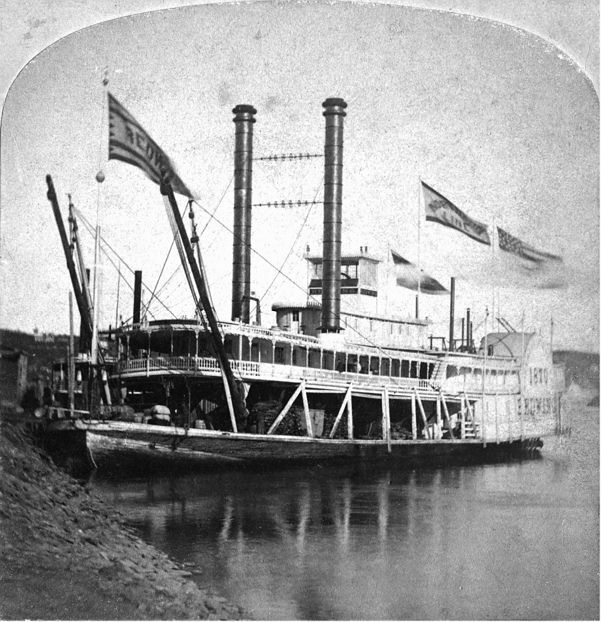 Captain Thomas W. Shields and others bought her and ran her New Orleans-St. Louis and also made Cincinnati-New Orleans trips. 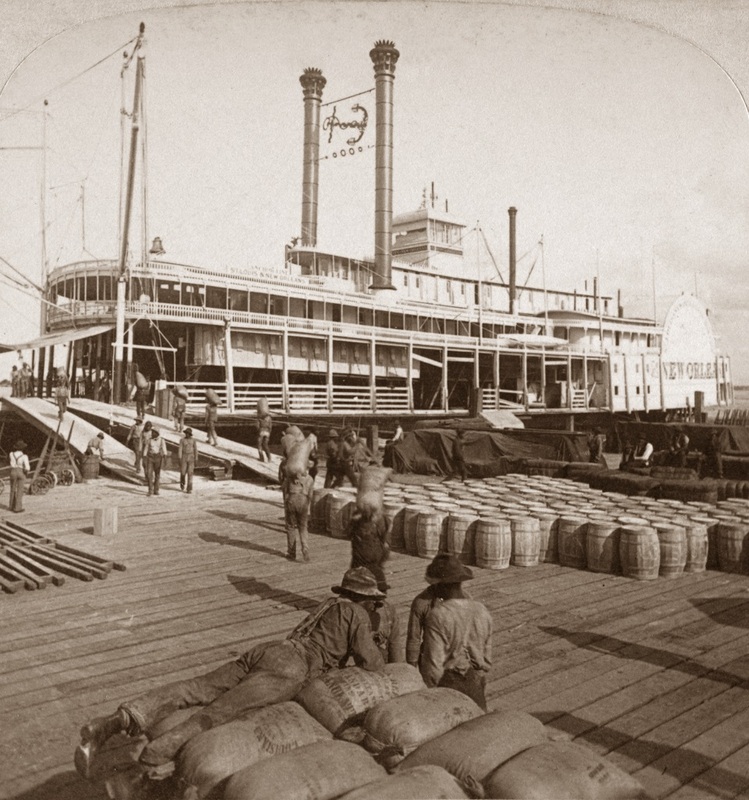 It is said she once went up the Wabash River to New Harmony, Indiana and brought out a large cargo of corn. She was incorporated into the Anchor Line circa 1876. 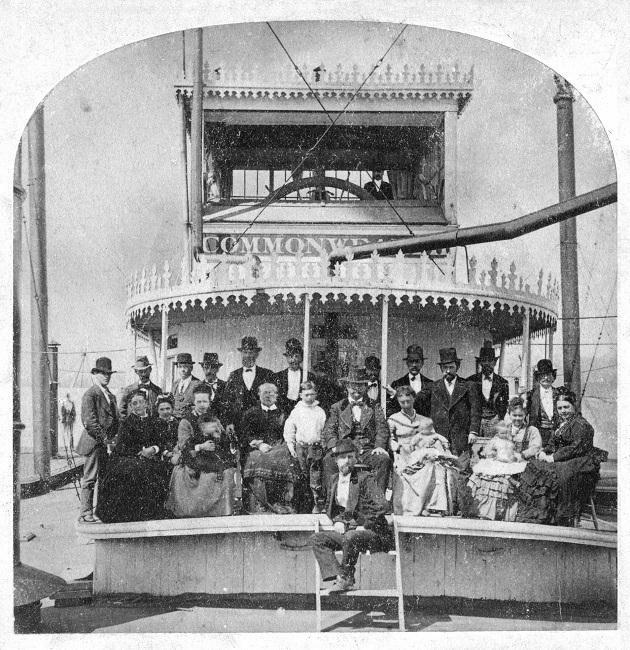 In her old age she was sold to a gentleman of Dover, Kentucky, who ran several Cincinnati-New Orleans trips with her, then pinch-hit in the excursion trade between Cincinnati and Coney Island. One night she ran over the Lame Duck and sank it. Frank L. Sibley recalled that she had a mockingbird whistle and had to lower her stacks to clear the Cincinnati suspension bridge even on ordinary stages. She burned at the foot of Whittaker Street, Cincinnati at 11:00 p.m., August 25, 1889. This is the "Left Eye" in a stereoview from my collection.